AJ-PCD35E (AJPCD35E AJ PCD35E) New P2 Card Drive with PCI Express (PCIe) Interface. 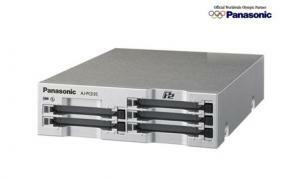 New P2 Card Drive with PCI Express (PCIe) Interface. The AJ-PCD35 offers increased transfer rates of max.1.0Gbps or higher with multiple 64GB P2 cards and up to 800 Mbps off a single 64GB P2 card. The AJ-PCD35's five PC card slots let you mount up to five P2 cards at the same time. This is especially convenient for editing a continuous clip recorded by a P2 cam in sequence onto multiple cards. The AJ-PCD35E supports all P2 card sizes, P2 formats and frame rates, storage capacity and compatibility is a non-issue, unlike many fixed format systems such as optical disc and tape. With five 64GB P2 cards inserted, the PCD35 can offer immediate access to more than 20 hours of DVCPRO, 10 hours DVCPRO50 or AVC-Intra 50, or more than 5 hours of DVCPRO HD or AVC-Intra 100 content.